The Sabres made a key free agent signing on Sunday, when they grabbed veteran goalie Carter Hutton. It’s a three year contract worth $8.25 million, an average of $2.75 million dollars a season. Here’s what you need to know about the newest Buffalo hockey player. Hutton is an older player, at 32. He didn’t enter the NHL until age 27. 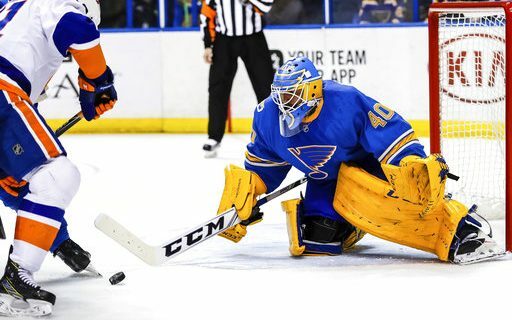 He’s backed up Jake Allen the past two years in St. Louis, starting 47 games and winning 30. Last year, he won 17 games, with a goals against of 2.09 and a save percentage of .931. Those numbers led the NHL. He has a career save percentage of .915, which is very good. He attended college at UMass-Lowell. He has worn the numbers 33, 30 & 40 with his previous teams. All three are available with the Sabres. For more on the Sabres free agency, stay with Buffalo Sports Page.